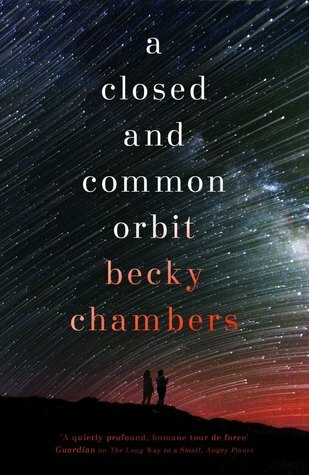 A Closed and Common Orbit felt even more insular and intimate than The Long Way to a Small Angry Planet, which was pretty closely focused on its crew. This book features Lovelace — the base AI Lovey developed from, but without her memories — and Pepper, who is a side character in the first book. It’s mostly about Lovelace, or Sidra, as she decides to call herself, and how she finds her way and figures out how to be herself, how to be a person, but it also follows Pepper’s past and shows how she got to where she was too. Found family is a theme here again, and there’s the same diversity of characters that a lot of people (including me!) loved from the first book. This book does improve on The Long Way to a Small Angry Planet in a key way: it doesn’t feel as much like the conflicts and problems are resolved too easily. It does feel as though the characters have to work for it, and have to compromise rather than get an ideal outcome. There were one or two cases of that in the first book, but overall it felt too easily solved; that’s not the case here, in my opinion, which makes the payoff the sweeter. Again, if soft SF is your thing, and you’re looking for something with interpersonal rather than intergalactic conflicts (though there’s some hints of the wider world as well) then this may well be your cup of tea. I’d start with the first book, though; it’s not necessary, but it gives you some context.